The United States Mint only issued the 2011 Platinum Eagle in proof format for collectors. For a third year, the bullion versions of the coin were not produced or issued. The single coin offering continued the six year design series exploring the core concepts of American democracy as found in the Preamble to the U.S. Constitution. Each design was inspired by narratives written by the Chief Justice of the Supreme Court. The annually rotating reverse designs were conceived for the numismatic versions only, but without bullion coins issued, the designs became the only ones used for the series. 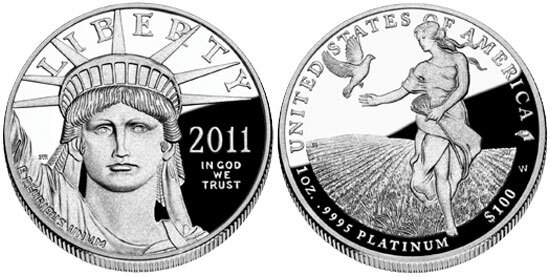 The 2011 Proof Platinum Eagle features the concept “To Insure Domestic Tranquility”. The reverse design carries the image of a harvest goddess emerging from a field of wheat, intended to symbolize the vastness of the nation and diversity of views. The harvest goddess holds a stalk of wheat in her left hand with her right hand extended to a landing dove, intended to symbolize the fulfillment of tranquility. The reverse was designed by Joel Iskowitz and sculpted by Phebe Hemphill. The American Eagle privy mark appears within the circular area containing inscriptions. 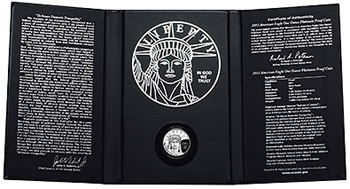 The obverse design of the coin features the familiar portrait of the Statue of Liberty designed by John Mercanti and used for all years and versions of the Platinum Eagle. A maximum mintage of 15,000 units was established for the 2011 Proof Platinum Eagle. This represented an increase from the 8,000 maximum established in 2009 and the 10,000 maximum established in 2010. Initially household order limits were imposed, but these were later removed. The pricing for the coins was based on the average market price of platinum and varied throughout the course of the offering. The initial price was $2,092 per coin, but it was reduced as low as $1,692 per coin. Sales of the coin began on May 26, 2011. Initial demand was lower than experienced in the prior two years. By May 29, sales had reached 6,786 units. By the end of the calendar year, sales approached 12,000 units out of the 15,000 maximum. Sales would extend into the following year, with a full sell out finally achieved in August 2012 after roughly 14 months of availability.